Football season is here with both NFL preseason and NCAA football games starting this month. Do you have all the football you want to watch on DIRECTV? Only DIRECTV brings you every play of every live out-of-market game, every Sunday. Get the action on your TV with NFL SUNDAY TICKET. Or up your game to NFL SUNDAY TICKET MAX and get real-time highlights, the RED ZONE CHANNEL®, and DIRECTV FANTASY ZONE CHANNEL™ right on your computer, phone, tablet, or game console. Get everything included with NFL SUNDAY TICKET plus a whole lot more. 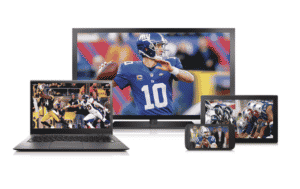 Stream LIVE games on almost any screen, virtually anywhere. See all the high-octane scoring drives from around the league on one channel with the RED ZONE CHANNEL® , on your TV, computer, mobile device, or game console†. Watch replays of entire games in 30 minutes or less with Short Cuts only on the NFL SUNDAY TICKET App. Short Cuts are available from midnight Sunday ET through midnight Wednesday ET via the NFL SUNDAY TICKET App. With the NFL SUNDAY TICKET app and your subscription to NFL SUNDAY TICKET MAX, you can stream any Sunday game LIVE on your devices†, track your NFL.com fantasy league and favorite players, get highlight alerts and play them with a tap. You can even tune your TV to the game playing on your tablet with a simple flick of your finger. CLICK HERE to see full list of compatible devices. †Only one game may be accessed from any device at any given time. Online access is only available on certain operating systems. Computer hardware, software, and Internet connection not included. Mobile access only available on certain devices. Additional data charges may apply. Please check with your service provider. Visit directv.com/nfl for a list of system requirements and compatible mobile devices. When you want to see the final yards of all the scoring drives around the league, just tune to the RED ZONE CHANNEL® (Ch. 703 -HD Only) and see them all on one channel—on your TV or your mobile device. Included with NFL SUNDAY TICKET MAX. Introducing DIRECTV FANTASY ZONE™ (Ch. 704 – HD Only) – a channel entirely devoted to fantasy football, exclusively on DIRECTV. Follow your players live from game to game for in-depth analysis, stats and more.THIS is how you do fantasy. Choose up to 20 players and keep tabs on their stats throughout the game day. Plus get Big Play alerts every time they make a great play. Requires a broadband connected HD DVR. Hate commercials? Use the NFL SUNDAY TICKET App to see replays of entire games in less than 30 minutes from midnight Sunday ET to midnight Wednesday ET. Whether you are a new or existing DIRECTV Commercial customer, don’t miss these fantastic rates for the 2016 NFL Season, which are only available for a limited time! Are you one of those bar or restaurant owners that has always wanted NFL SUNDAY TICKET, but thought it was too expensive, because your business was too small or you just didn’t have enough TVs? DIRECTV heard you and you can get 2016 NFL SUNDAY TICKET for your Bar or Restaurant with a Fire Code Occupancy (FCO) of 50 or less and 1-4 TVs for just $499.00. With NFL preseason games under way its time to let your customers know that you will have NFL SUNDAY TICKET on your TVs. DIRECTV makes that easy with FREE NFL SUNDAY TICKET promotional kits through the MVP Marketing program. 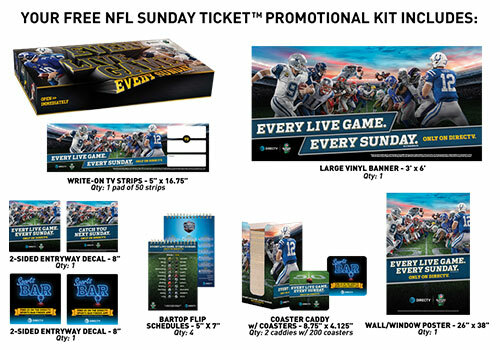 NFL SUNDAY TICKET marketing kits began shipping on 8/15 to all DIRECTV bar/restaurant customers who subscribe to the 2016 season of NFL SUNDAY TICKET. No matter where you are, with ESPN College Extra on DIRECTV you can follow your favorite teams and players. ‡ -All in HD. Actual number of games varies by market. Blackout rules and other conditions apply to all sports programming. Games telecast locally may be included in ESPN College Extra. To access DIRECTV HD programming, HD equipment is required. 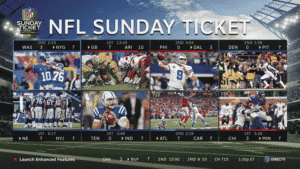 2016 NFL SUNDAY TICKET OFFER: In order to receive NFL SUNDAY TICKET, customers must subscribe to a commercial base programming package with a 24-month agreement. 2016 NFL SUNDAY TICKET price based on FCO (Fire Code Occupancy) and is subject to verification. Customers must order by 8/01/16 and activate by 9/1/16 to be eligible for the 5-Pay option. Customers must order by 10/1/16 and activate by 11/1/16 to be eligible for the 3-Pay option. Customers must order by 12/1/16 and activate by 1/1/17 to be eligible for the 1-Pay option. The remaining balance of NFL SUNDAY TICKET will be charged to customer’s account in the event of early disconnect. NFL SUNDAY TICKET consists of all out-of-market NFL games (based on customer’s service address) broadcast on FOX and CBS. Other conditions apply. LIMIT ONE NFL SUNDAY TICKET OFFER PER ACCOUNT. Offer void where prohibited or restricted. NFL SUNDAY TICKET subscription will automatically continue in 2017 and each season thereafter at a special renewal rate unless customer calls 1-866-945-9940 to cancel prior to start of season. Subscription cannot be canceled (in part or in whole) after the start of the season and subscription fee cannot be refunded. Commercial locations require an appropriate licensee agreement. NFL, the NFL Shield design and the NFL SUNDAY TICKET name and logo are registered trademarks of the NFL and its affiliates. NFL team names and uniform designs are registered trademarks of the teams indicated.